The new U.S. general leading the mission in Afghanistan gave a surprisingly candid interview this week on the situation in-country. In his first interview since taking command of NATO’s Resolute Support mission in September, Army Gen. Austin Miller’s thoughts seem to mirror the pessimism felt by the American people as the war in Afghanistan treads past the 17-year mark. “This is not going to be won militarily,” Miller told NBC News in an exclusive interview. “This is going to a political solution." Miller’s comments reflect several realities portrayed in the latest report from the leading U.S. government oversight agency on Afghanistan. As of July, the Afghan government controls or influences only 55.5 percent of the country’s 407 districts. That is the lowest level since the Special Inspector General for Afghanistan Reconstruction, or SIGAR, began tracking district control in November 2015, according to the group’s quarterly report released Thursday. Although the exact numbers are classified, Resolute Support also said that the average number of Afghan government force casualties from May to October 2018 is the highest it has ever been during similar periods. May was the most active month, accounting for 26 percent of all casualties during this five-month period. About 52 percent of the casualties during this time came during checkpoint operations, while 35 percent occurred during patrols. SIGAR reported that the number of checkpoint casualties is increasing while the number of patrol casualties is decreasing. The somewhat good news is that the Afghan government’s control over the total population in-country remains unchanged since this time last year at 65 percent. Roughly 12 percent of Afghanistan’s districts are now reportedly under insurgent control or influence, according to SIGAR. About 32.4 percent of Afghan districts are contested — which means they are neither controlled by the Afghan government or the insurgency. Since SIGAR began receiving district control data in November 2015, Afghan government control and influence over its districts has declined by about 16 percent; contested districts have increased by about 11 percent; and insurgent control or influence has risen by 5.5 percent. “The control of Afghanistan’s districts, population, and territory overall became more contested this quarter, with both the Afghan government and the insurgency losing districts and land area under their control or influence,” SIGAR officials wrote in their report. When Miller took over the war in early September, Afghan soldiers were already being killed and wounded at record numbers. Miller told NBC News that he kicked off his tenure by pushing out a more aggressive policy of helping the Afghan military locate and defeat Taliban fighters. But in that new interview, Miller also acknowledged that Afghanistan requires a political, not military, solution to its woes. Miller also narrowly escaped a Taliban attack unharmed on Oct. 18 in Kandahar city during a meeting with Kandahar’s governor. The Taliban had managed to turn one of the governor’s bodyguards to their side, who then initiated an insider attack at the conclusion of the meeting. A key U.S.-backed Afghan warlord in the country’s volatile southern region, Kandahar police chief Gen. Abdul Raziq, was killed in the attack. Raziq was arguably the most important power broker in the region. Brig. 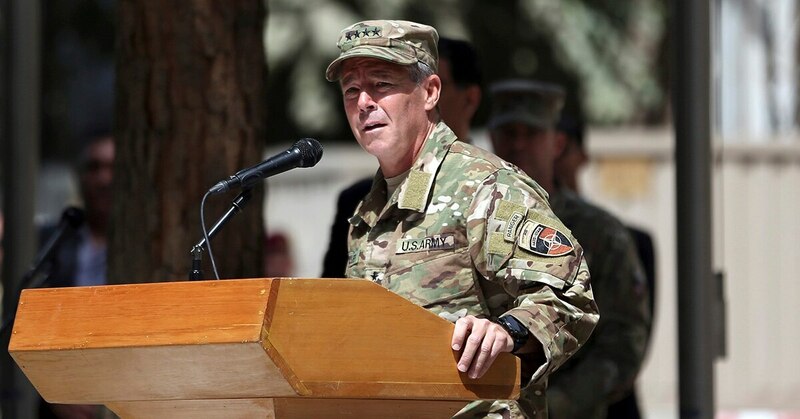 Gen. Jeffrey Smiley, the U.S. general in charge of Resolute Support’s advising mission in southern Afghanistan, and another unidentified civilian were also wounded in the attack. Afghanistan’s summer fighting season was also marked by a notable loss for Afghanistan’s elite Commando units, who were routed in their defense of Ghazni city, less than 100 miles from Afghanistan’s capital of Kabul, from a Taliban offensive in August. Although the Commandos eventually rallied to retake the city with the help of U.S. special operations forces, the fact that such an elite unit was overrun and reportedly took a high rate of casualties may indicate fatigue and overuse among its troops. The cumulative funds allocated for reconstruction and related activities in Afghanistan since fiscal 2002 totals roughly $132 billion, according to SIGAR. Karzai: 5 Taliban leaders freed from prison in exchange for U.S. Army Sgt. Bowe Bergdahl are “good Afghans” who deserve role in peace negotiations.